A young star-forming clump of gas in deep space has been detected by scientists using observations from the Hubble Space Telescope. The clump, identified here, could shed light on galaxy formation in the early universe. Scientists have spotted a kind of young birthplace for stars in telescope observations for the first time. The newborn star-forming clump in deep space is a giant cloud of gas that may have given birth to dozens of stars a year, researchers say. The discovery could shed light on galaxy formation in the early universe, when star formation was at its peak, scientists added. "Clumps have been extensively studied so far, but for the first time, we have observed a newly born one," study lead author Anita Zanella, an astronomer at the French Alternative Energies and Atomic Energy Commission, told Space.com. Until now, studied clumps usually contained stars more than 100 million years in age, meaning the clumps were correspondingly old, Zanella said. She and her colleagues instead looked for relatively young stars, which in turn could reveal the presence of relatively young clumps. The astronomers used NASA's Hubble Space Telescope to discover the clump, which is located in a galaxy nearly 10.4 billion light-years away, dating back to when the universe was only about 3.3 billion years old. The scientists calculated that the clump was about 3,000 light-years wide and more than 1 billion times the mass of the sun. Based on the light detected from the clump, the researchers estimated that the gas cloud produced "the equivalent of 32 stars with the mass of the sun every year," Zanella said. This accounted for nearly 40 percent of the stars produced in the galaxy hosting the clump. All in all, "the clump formed stars 10 times more efficiently than normal galaxies," Zanella said. By analyzing the initial phase of clump formation, this research favors a theory that suggests star-forming clumps begin as giant, dense pockets in highly turbulent, gas-rich matter in young galaxies. The researchers' preliminary estimates suggest that giant clumps such as the one they discovered live about 500 million years. This research suggests that giant clumps are not rapidly destroyed by the energetic winds from the stars they created as some had previously argued. Instead, the clumps could live long enough to migrate toward the centers of galaxies. "Clump migration could thus explain why and how galaxy bulges form," Zanella said. 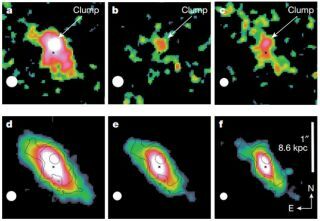 Future research with other telescopes could help discover additional young star-forming clumps, yielding insights on galaxy formation, Zanella said. That research could possibly involve the Atacama Large Millimeter Array in northern Chile and the James Webb Space Telescope, whose launch is planned for the end of 2018.